Pitcher Tom Gorzelanny had a 3.90 ERA in 43 games for the Brewers during the 2013 campaign. 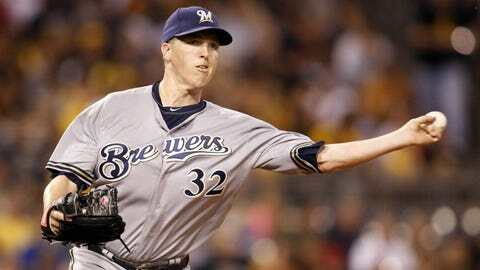 MILWAUKEE — Milwaukee Brewers left-hander Tom Gorzelanny is recovering well from an early December surgery to clean up a left shoulder injury that caused him to miss the last month of the 2013 season. Gorzelanny, who had a 3.90 ERA in 43 games for the Brewers in 2013, is shooting to be ready to go for Opening Day or soon thereafter. "It was something I (was) glad I got done and cleaned up," Gorzelanny said Sunday at Brewers On Deck. "With everything the way it’s going, it’s feeling better every day. I think spring will be good. If everything goes right, I should be ready for the season." A couple of weeks out from throwing, Gorzelanny will begin a throwing program that he must complete before he can throw off the mound. He then hopes to get into a couple of games at the end of spring training. Gorzelanny was much more effective as a reliever than as a starter last season, posting a 2.70 ERA in 33 games out of the bullpen and a 4.81 ERA in 10 starts. Knowing he is going to be coming out of the bullpen this season will help him to be ready sooner than he would have been as a starter. "Starting you need to build up your innings," Gorzelanny said. "If I was starting, you would be looking more at May when I was coming back. I don’t need 10 appearances in spring to be ready for the season. I just need to get out there, face some hitters a few times and be ready to go." Reynolds introduced: It’s rare a player signed to a minor-league contract is brought to Brewers On Deck, but first baseman Mark Reynolds was on hand Sunday. It’s a good sign for the veteran, as he likely has a leg up to become the Brewers’ everyday first baseman. Lyle Overbay wanted to attend the event, but he had a family commitment preventing him from coming to Milwaukee. "Number one, the fans are amazing," Reynolds said of his decision to sign with the Brewers. "Coming here as a visitor, they pack that place. That’s always great for a player. To be able to come and compete for a true starting position was really a big factor in where I wanted to sign. "I also can come back to the NL after being in the AL for four years. It was a pretty easy decision once they called and I talked to Doug and Ron. It was just a good fit, I thought." Reynolds and Overbay were brought in to compete with Juan Francisco and Hunter Morris for the starting job. The Brewers will head into spring training with options, something they really didn’t have last year after Corey Hart had surgery in the winter and Mat Gamel was hurt in spring training. Brewers manager Ron Roenicke spoke to Reynolds’ versatility as a plus, as he can spell Aramis Ramirez at third base from time to time. "These guys still need to make our team, but they are guys that we know what they can do," Roenicke said of Reynolds and Overbay. "I think they are important to have, especially with all the experience they have at that position and hitting anywhere in the lineup." Buying the Bucks? : Brewers owner Mark Attanasio has long been rumored as a potential owner of the Milwaukee Bucks and with current Bucks owner Herb Kohl seeking investors to buy into the franchise, the question was asked Sunday. Attanasio gave an interesting response, not saying he is interested, but also not ruling anything out. "I’m going to take a page from Doug Melvin," Attanasio said. "I think one of the things Doug does so well is he’s quiet and goes about his business. I never comment on things I might be interested in or not because it raises or dampens expectations. I can’t address that." Another heavily talked about subject has been about the Brewers’ status with their spring training home, Maryvale Baseball Park. The club signed a 10-year extension with the city of Phoenix in 2013, but has opt-out options in the deal. Milwaukee began using Maryvale Baseball Park as its spring training home in 1998. The facility has become outdated in comparison to others in the area and isn’t located in the best part of town. "We are always looking to do the best we can wherever we are," Attanasio said. "If we stay in Maryvale, we’re going to do everything we can to improve the facility and otherwise we are going to be on the lookout to see where we can do better than Maryvale. That’s always going to be the case." Attanasio did say sites in Florida were a potential option, but nothing on that front has been discussed recently. "One of the things I learned early in my business career is that you don’t discard any options," Attanasio said. "So I will look at every option in that regard. I’m sure Florida is an option. "It kind of heats up and cools down. I’m not aware of anything recently in Florida. About a year and a half ago there was something very hot and heavy but it just died." Turning out: The Brewers officially announced the attendance for Sunday’s Brewers On Deck at 14,183, an all-time record for the annual event. It was an impressive turnout, especially considering the weather in Milwaukee was very cold and snowy, but the Brewers offering free admission to the event certainly helped.